Bethesda, is in Montgomery County in Maryland. The actual name Bethesda comes from a local church that was rebuilt in 1850. 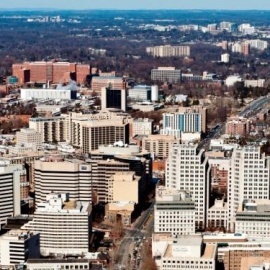 In Forbes magazine, Bethesda, listed as one of the highest as the most educated town. The town itself placed in at number eleven as the top earning american town. Bethesda itself has no physical boundaries and the population is around fifty-five thousand people. Bethesda runs along the original route of the ancient native american trail. It is now, a toll road for washingtone and rockville. The important landmarks include the National Institutes of health, the Consumer Product Safety Commission, as well as the Walter Reed National Military Medical Center. These are all must see sites if your taking a vacation to Bethesda. One of the most well liked things in Bethesda is the AT&T National golf tournament. So if your into golf, you may want to play a round or two at the Burning Tree Club where the tournament is played at. Bethesda is a low crime but with rapid job growth town. It is closeby to Washington D.C. so that it makes the town look more attractive, not that it needs any help. There are well over two hundred restaurants in Bethesda, so if your looking for a different variety of foods, this is defintely the place to visit. If your just looking for a place to relax, take in a few museums, and even relax further by watching a golf game or lounging around the pool at your hotel, then Bethesda is definitely the place for you. Friday afternoon, April 26, Patrons and Caucus Members are invited for an exclusive tour of the private collections of the Pratts and Grainers. A new French spring menu is arriving at Mon Ami Gabi – and you can be among the first to learn how to prepare signature dishes from our new spring menu. Hosted by the BCC-Rotary along with the Mexican Embassy, the event, a celebration of Mexican culture, will take place in downtown Bethesda, Maryland. Enjoy samples while watching demos from some of the top grill brands, including Weber, Traeger, and Big Green Egg! Take advantage of discounts on select grills! Enjoy an evening of Yoga, Painting, and Wine! Rising star, tenor Brian Giebler presents a compelling concert of English song by Ivor Gurney and Benjamin Britten. "Perhaps the finest was the tenor Brian Giebler’s aria, 'Erwäge' ('Consider'), rendered with lovely tone and deep expressivity..." ? The New York Times "
Spring for fashion! The hottest warmer-weather looks are rolling out at Clarksburg Premium Outlets.